The Commonwealth of Puerto Rico Quarter is the second installment of the D.C. and U.S. Territories Quarters Program. Christopher Columbus first arrived at Puerto Rico in 1493, and within a few years, it became a Spanish colony and important military outpost. It would remain under Spanish control for many years successfully fighting off multiple attempts by other countries to conquer it. Following the Spanish-American War between the United States and Spain, it was ceded to the US in 1898. In 1950, Puerto Rico was allowed to draft its own constitution, and it officially became a United States commonwealth on July 25, 1952. San Juan, capitol city of Puerto Rico, is characterized by the walls of stone that served to protect it during the centuries of conflict it had seen. Sentry boxes located at strategic points of the wall help to symbolize its strength. The other quarters available in this series are the District of Columbia quarter , the Guam quarter, the American Samoa quarter, the U.S. Virgin Islands quarter and the Northern Mariana Islands quarter. All will be released throughout 2009 in quantities to meet demand. 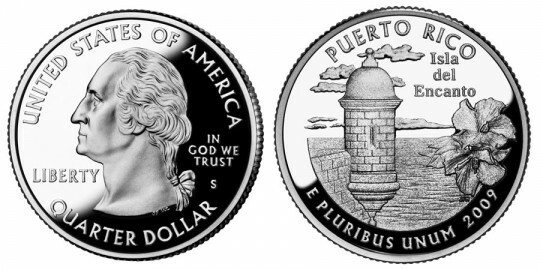 A sentry box in Old San Juan overlooking the sea with a hibiscus flower is featured on the reverse along with "PUERTO RICO", "E PLURIBUS UNUM", "2009" and "ISLA DEL ENCANTO" which means Isle of Enchantment. Joseph Menna was the designer.